Please contact one of the following to purchase a raffle ticket over the phone by credit card. RAFFLE TICKET PURCHASE IS NECESSARY TO ENTER OR WIN. The purchase price has been set at $100.00 per ticket. A limit of 750 raffle tickets will be printed. ELIGIBILITY: The raffle is open only to legal residents of the 50 United States and the District of Columbia, who are 18 years of age or older as of 10/20/18 and who possess a valid driver's license. Winner(s) of the Shotgun and Pistol will obtain them from a licensed dealer and will have to pass a background check. HOW TO ENTER: Any committee member of Commissioner Andy Meyers Fort Bend Ranchers' Ball will have raffle tickets to purchase at the listed price. Any tickets not sold prior to the event on Saturday, October 20, 2018 will be available for purchase at the event. 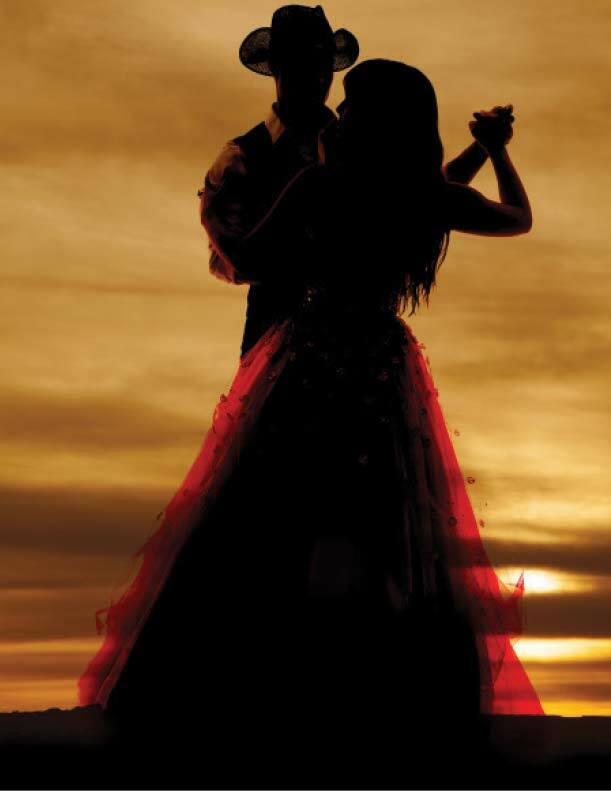 The drawing will be held at the Ranchers' Ball. You do not need to be present to win. PRIZE: The following prizes will be awarded sponsored by BMW of West Houston, Lone Star Chevrolet in Jersey Village, Lone Star Ford in Houston. WINNER WILL BE SOLELY RESPONSIBLE FOR TAX, TITLE AND LICENSE EXPENSES. Second and third prizes are sponsored by Mockingbird Precision in Houston. 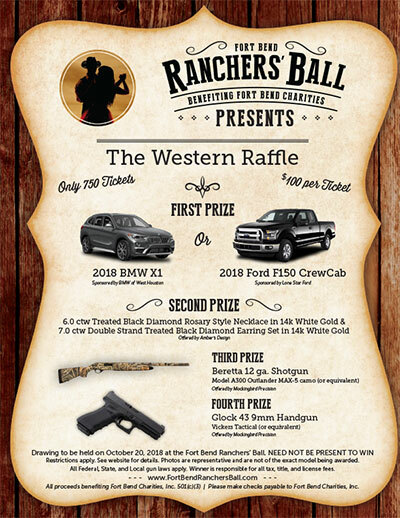 NOTIFICATION: The drawing will be held at the Ranchers' Ball on Saturday, October 20, 2018. Winner does not need to be present to win. If the winner is not present at the ball, the winner will be notified the following week by whatever methods appropriate. RELEASE: By participating in the raffle and/or accepting a prize, a participant/winner agrees to defend, release, and hold harmless the Sponsor, and its parents, subsidiaries, affiliates, divisions, advertising and promotion agencies, and the foregoing companies' officers, directors, shareholders, members, managers, employees, representatives, and agents (collectively "Releases") from and against any actions, claims and/or liability for injury, death, loss or damage of any kind (including any for the violation or infringement of any proprietary or personal right of any individual or entity)("Liability") resulting in whole or in part, directly or indirectly, from participant's participation in the raffle, and/or participant's use, acceptance, or possession of a raffle prize, and/or participant's participation in a raffle prize-related activity. By participating in the raffle and/or accepting a prize, a participant/winner consents to and gives the Sponsor the right to interview, photograph/video a winner, and in perpetuity to freely and exclusively use, publish and display a winner's (and where applicable a participant's) names, address, entry form, picture, portrait, likeness, voice, video, statements, quotes, biographical information, and prize information (in whole or in part, as may be adapted, edited, or modified, as solely determined by Sponsor) for advertising, trade, publicity and promotional purposes in any media now known or hereafter discovered, worldwide, and on the World Wide Web, without review, notification or approval, all without additional consideration, unless prohibited by law. Entries will not be acknowledged or returned. LAWS: Subject to all federal, state and local laws and regulations. SPONSOR: Fort Bend Ranchers' Ball hosted by Fort Bend County Precinct 3 Commissioner Andy Meyers on behalf of Fort Bend Charities, Inc.